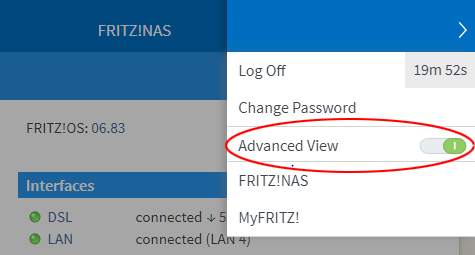 When the Standard View is selected, not all of the settings are displayed in the FRITZ!Box user interface. In the Advanced View, additional settings are displayed for advanced users. How to change the view depends on which version of FRITZ!OS is installed. Open the FRITZ!Box user interface. Click the three dot menu in the upper-right corner of the user interface. Click the on/off switch to enable the advanced view. The advanced view is enabled when the on/off switch is green . Click "View: Standard" in the lower section of the user interface. The advanced view is enabled if is displayed.